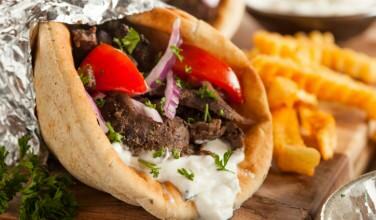 The Gyro is Greece's Favorite Street Food! The Gyro is Greece’s Favorite Street Food! Written by GreekBoston.com in Greek Cooking Comments Off on The Gyro is Greece’s Favorite Street Food! It’s hard to go anywhere in Greece without bumping into a street cart or small restaurant serving them. You can usually smell the before you see the restaurants and they’re so popular, chances are pretty good that you’ll see people munching on them as they walk, being careful not to make a mess of their clothes. Greeks rarely eat while they walk, but the gyro is one of the only exceptions. For the hungry traveler, an artfully prepared gyro can help pass the time during long waits at the bus terminal or for those moments in between meals when sightseeing caused you to work up a considerable appetite. And there’s nothing like lounging on a beach chair overlooking the Aegean and taking that memorable first bite. For those who don’t know what they are, it can be a little jarring to see the slab of meat hanging from a spit in the kitchen area. For people who live in the United States, we aren’t used to seeing meat that is exposed like that. In Greece, however, it’s the norm. The meat is typically made from pork or lamb or a combination of both. However, you can also find gyro meat that is made from chicken or turkey. It’s also kept warm and ready to eat. When you order a gyro, they’re made fresh. The cook takes a long knife and slices just enough warm meat for your gyro. 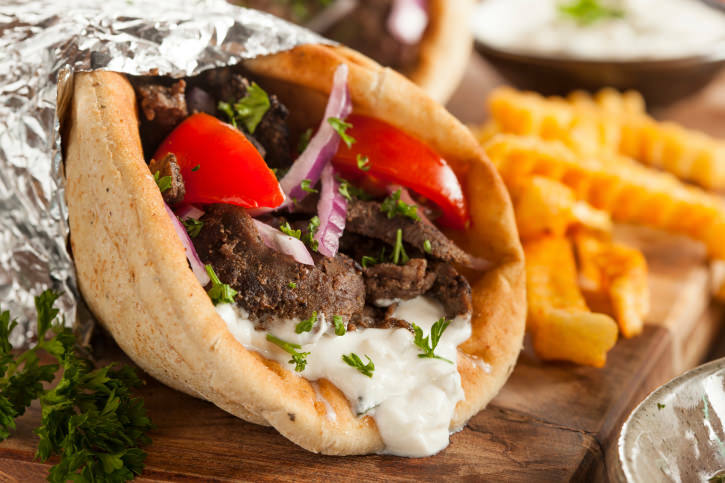 He places the meat in the center of a round of flat pita bread, topped with onion, tomatoes, and tzatziki, and finished with a few French fries. When eating a gyro in the United States, the French fries are often left out. However, they’re the norm in Greece. One of the most endearing things about this traditional Greek “fast food” is how fresh the ingredients are. 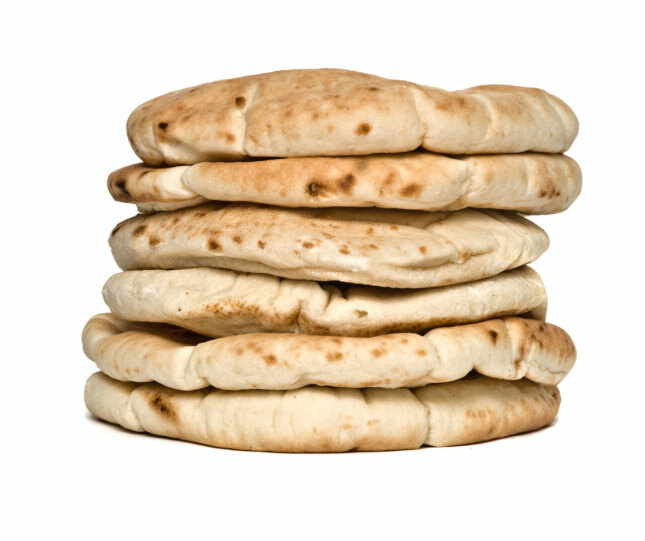 Since this is such a popular snack, restaurants go through a lot of gyro meat each week. This means that when you order a sandwich, the meat hadn’t been sitting around for long. 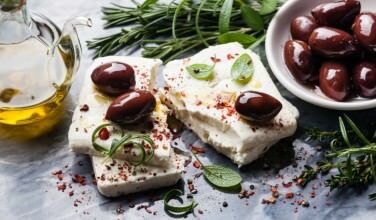 Not only that, but the tzatziki is typically made fresh on a regular basis, especially since most Greek cooks know how important it is to use fresh ingredients. The tomatoes and onions are chopped fresh on a daily basis, and the tomatoes are especially good because they’re locally grown. Even though there is a fairly standard way to make a gyro, no two are made alike. Some people opt out of putting French fries in their gyro. Others like certain kinds of meat more than others. 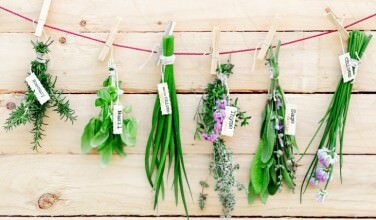 For those who can’t stomach onions, they may put scallions or even chives instead. 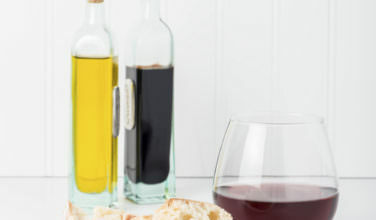 Not only that, but there are so many different kinds of tzatziki recipes out there, one ingredient change can alter the entire flavor of the gyro. This isn’t as chaotic as it sounds. Rather, it only adds to the charm of these sandwiches. In some cases, you can even order a “deconstructed” gyro where all he ingredients are laid out on a plate, with no pita bread to be seen.